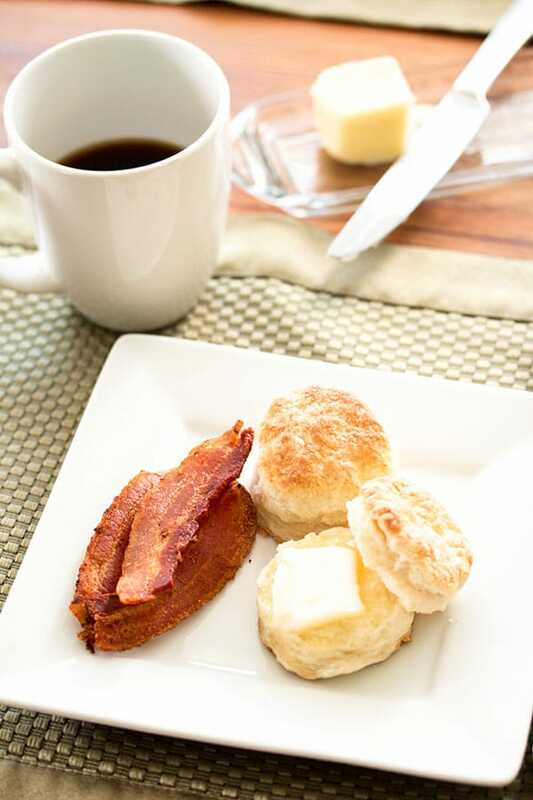 Biscuits in the south are a tradition and our buttermilk sugar biscuit is our version of the southern classic. It seems that every household in the deep south has their own special recipe for biscuits. Our house is no different. Nothing gives me more joy on a Saturday or Sunday morning than whipping up a batch of buttermilk sugar biscuits for breakfast. My wife and I have worked on our own recipe for the past few years. We could always make a solid biscuit, but it was never exactly what we were looking for. 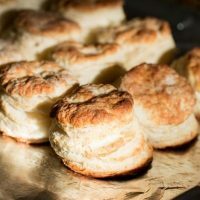 We have tried traditional southern biscuit recipes, buttermilk biscuits, and cream biscuits. 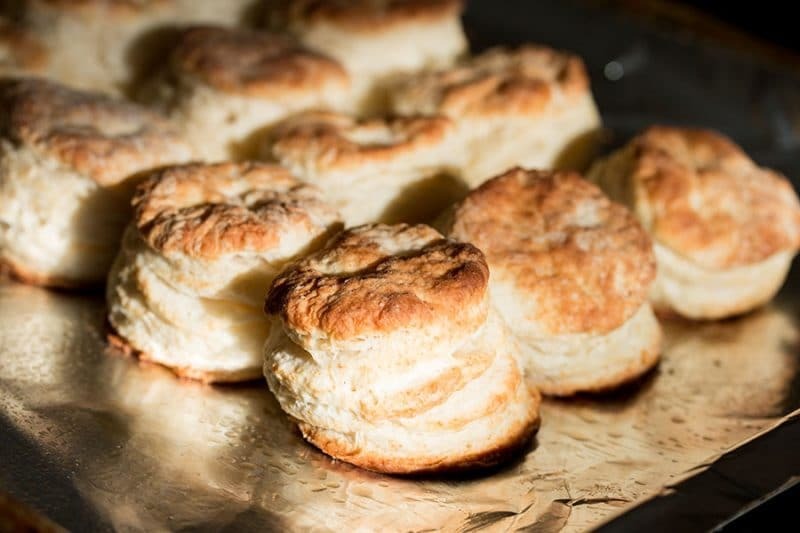 Cream biscuits were our jam for a while, but we finally came across a buttermilk biscuit recipe that was also the cat’s meow. We could never decide on which recipe to make for breakfast, so we combined them! Through experimentation, my wife and I were able to combine the best of both cream biscuits and buttermilk biscuits. These are best straight from the oven slathered in butter. Sometimes Grape Jelly makes its appearance too. Store leftover biscuits in an airtight container, give it a 15 to 30 second warm-up in the microwave if you want them warm. You can also freeze extras in the same method you already freeze any bread kind of foods. If microwaving from a frozen state, wrap it in a paper towel and microwave for 30 seconds. Check to see if it is warm enough and add another 15 to 30 seconds if necessary. Even though Buttermilk Sugar Biscuits is one of my favorite weekend pleasures, sometimes I want something a bit more substantial. Those weekends Fluffy Maple Vanilla Buttermilk Pancakes make an appearance. A delicious biscuit recipe that's a blend of buttermilk and cream biscuits. Combine the flour, sugar, baking powder, and salt into a mixing bowl. Mix with a whisk to distribute everything evenly. Cut in the butter using your hands, fork, or pastry cutter. We prefer using our hands because it's a little quicker, but a little more messy. Mix in 3/4 of the buttermilk and bring together. If your dough feels too dry, use a little bit more butter milk. The exact amount of buttermilk you need will vary depending on the flour. Dust counter with 1/8 of a cup of flour. Pour dough out onto the counter. Using your hands, smash the dough into one mass. Using your hands to flatten the dough until it's roughly 1/2 inch thick. Fold the dough in half and flatten again until 1/2 inch thick. Repeat the folding and flattening steps 6-8 times. This is an important steps as this gives the biscuits layers. Using a rolling pin, roll the dough out until it's a 1/4 inch thick. Place your biscuits onto a greased baking sheet and bake for 12-15 minutes. The thinner you make your biscuits the shorter the cooking time. Slather each biscuit in butter and/or jam. Thanks for visiting the blog! the beautiful part about this recipe is that you can adjust the sugar up or down without worries. 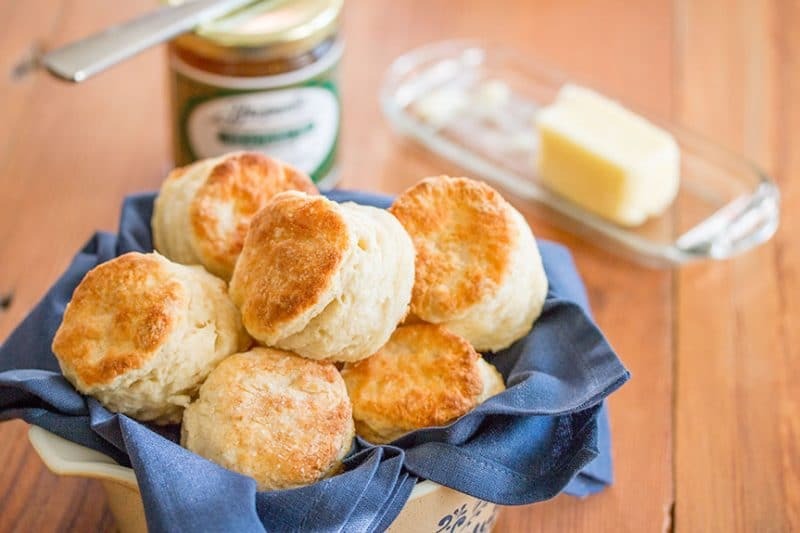 Great recipe for someone looking for a fun twist on a traditional southern biscuit. I prefer to use less sugar.